Assam picked up a bonus point after Krishna Das ran through Tripura's batting in Guwahati. 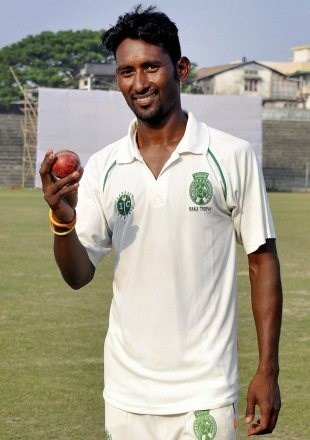 Starting the third day trailing by 138, Tripura's second innings folded for 155, with medium-pacer Krishna picking up seven wickets to finish with match figures of 10 for 91. This left Assam chasing a target of 16 runs, and they completed the job without losing a wicket. Tripura were 2 for 0 at the start of the day, and their openers put on 39 before Krishna picked up his first wicket. The top four all got into double figures, and their third-wicket pair of Rajesh Bainik and Rakesh Solanki put on 73 to steer Tripura to a solid 113 for 2, before the wicket of Bainik began a collapse that saw eight wickets fall for 42 runs. All seven batsmen Krishna dismissed were out bowled or lbw. Hyderabad took firm control of their clash against Andhra, as three-wicket hauls from Syed Quadri and Ravi Kiran helped the team collect a crucial first-innings lead. In reply to Hyderabad's 522, Andhra began the day well-placed at 121 for 0, but were dealt an early blow when the opener Srikar Bharat (75) was dismissed in the first over. Bharat's opening partner Prasanth Kumar carried on, stroking a fourth first-class hundred, but none of the other batsmen were able to make good on their starts and raise a fifty, as Andhra were bowled out for 369. Prasanth hit 17 fours and a six during his 124, while for Hyderabad, Quadri picked up 3 for 54 and Kiran took 3 for 103. With a 153-run lead in hand, Hyderabad enforced the follow-on. Andhra were 24 for 0 at stumps. Services were stung by Himachal Pradesh's lower order on the third day which resulted in a 253-run deficit for the home team at the Palam Ground in Delhi. They then lost their top three batsmen in the latter half of the day and were left staring at a possible defeat. Services were still 162 short of making Himachal bat again. Resuming from their overnight 255 for 6, Himachal lost their seventh wicket after the addition of 16 runs. But if Services thought they would be able to bat again soon, it was not be. Nikhil Gangta, who has a scored a century in first-class cricket previously, added 55 for the eight wicket with Karnaveer Singh, followed it up with a 77-run partnership along with Vikramjeet Malik (59 off 47 balls), before adding 75 for the last wicket with Pankaj Jaiswal (41 off 46 balls). Gangta fell one short of a century; he was the last wicket to fall. But by that time, the team had scored 224 runs in 49.1 overs. Amit Verma's ninth first-class century anchored the Kerala innings in their response to Goa's 367 in Wayanad. Verma was the last batsman to be dismissed on the day - after a 287-ball 129 that included 13 fours and three sixes - but the innings ensured Kerala moved within 68 runs of Goa's total. Kerala started on 60 for 2 but were jolted in the fifth over of the morning as KB Pawan was caught behind off Saurabh Bandekar. The dismissal brought Sanju Samson to the crease but he could only score 24 from 95 balls before being dismissed by Shadab Jakati. Sachin Baby, the Kerala captain, added 80 for the fifth-wicket with Verma before being caught behind off Jakati for 31. Verma found a solid ally in Nikhilesh Surendran and the two put the best stand of the innings - 86 runs in 30.3 overs - to edge Kerala closer to the target. However, Verma was dismissed four overs before the close of day, leaving both sides with a chance of grabbing the point for first-innings lead on the fourth day.